Oracle documentation indicates that effective January 20, 2019 access to OracleJDK for production use is limited to customers with a support contract. This will impact production use of Java applications as well as the ability to get patch updates and support. Most customers have not planned for this un-budgeted expense which could sink your IT budget. Fortunately, there is an alternative which could be implemented for little or no additional cost. Customers who don't act (by either purchasing OracleJDK or moving to an alternative) could expose themselves to risk. 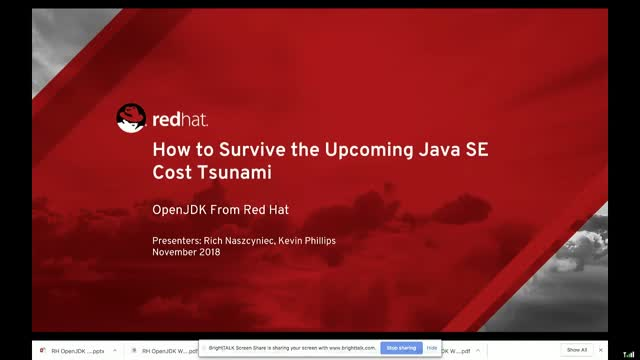 Join Red Hat to learn about Red Hat’s lifeline for Java workloads - the OpenJDK. Don’t wait – January 20th is less that 3 months away. Kevin Phillips, Middleware Solutions Sales Specialist, Red Hat. The Wall Street Journal reports that in 2014, US and European banks paid nearly $65 billion in penalties and fines, some of which are penalties directly tied to ineffective complaints reporting and management. Financial regulatory laws strictly govern the handling of complaints in banks and other financial institutions, and they are held responsible for poor complaints handling and lack of transparency. This is the prime reason why banks must monitor, analyze, and manage the customer experience. This presentation and demonstration shows how Red Hat technologies can be used to implement a Case Management system that handles both the typical and the unexpected cases using Red Hat Decision Manager, Red Hat Process Automation Manager, Red Hat Fuse and OpenShift in a efficient, manageable and extensible manner. The webcast was presented at the Enterprise Integration Summit: Integration & APIs, Integration Developer News (January 2019). It provides an introduction to Red Hat AMQ Streams. Communications service providers face many challenges due to increasing costs, eroding revenues, and decreasing efficiency—especially with operations support systems (OSS) and business support systems (BSS). Red Hat application programming interface (API)-centric agile integration solutions can help communications service providers increase agility, innovation, and revenue. Recent public breaches highlight the importance of a security strategy that extends beyond the network perimeter. Applications developed and maintained without security in mind present a likely entry point for malicious attackers. Preventive measures should be taken to reduce vulnerabilities that can avoid zero-day attacks. As organizations adopt containers, an automated approach to security, testing, and application development is needed to increase productivity and reduce risk. •Integrate security monitoring software into continuous integration/continuous delivery (CI/CD) pipelines for containerized applications. •Help you understand what's in your containers and where they come from, which is vital to maintain security and quickly remediate workloads. •Ensure the validity of images with signing. •Enhance open source library security, in true DevSecOps fashion, and establish a security-first mindset for application development. "Reactive” is a loaded word. Reactive programming, reactive software, messaging, spreadsheets, scalability, events, the list continues. What does it all mean and how does it fit together? This webinar will showcase the new Red Hat® OpenShift® Container Platform and Red Hat OpenShift Application Runtimes bundle in the context of reactive systems development. Enterprises increasingly rely on open source projects to accelerate application development. The benefits of developing with open source include incorporating innovation from outside your organization, attracting and maintaining talent, and providing greater visibility into how the software works. Organizations need to balance these benefits with strategies for mitigating the associated risks, which might include complexity of rapidly changing projects, impacts on stability resulting from varying project maturity, and inconsistent approaches to security. To mitigate these risks, Red Hat and JFrog offer a stable solution for application development and runtime. Red Hat® OpenShift® provides a solid platform with security for consistent developer workflow and operations, and JFrog Artifactory ensures that developers are using secure packages that are run in the right environment with the best performance characteristics. The combination of both products allows users to gain the benefits of open source while maintaining consistency and security. •	Details and information about Red Hat OpenShift and JFrog Artifactory. •	A demonstration showing polyglot application development, tracing the provenance of packages through security policy to the container runtime. No industry is safe from being disrupted by fast moving new entrants and new opportunities are continuously arising to be taken advantage of by the fastest mover. Businesses need to adapt quickly to being able to react to changing conditions and IT has often been a stumbling block. In this talk we discuss how Agile Integration can turn IT into a powerful asset: not just enable the transformation of technology, but also to align people and processes for success. We’ll cover numerous real world examples and a repeatable blueprint for success. David Ingham - Director, Software Engineering, Red Hat. Jakub Scholz, Principal Software Engineer, Red Hat. With the introduction of the Red Hat® AMQ streams component, you can now use the massive scalability of Apache Kafka on the most advanced container management technology, Kubernetes, using Red Hat OpenShift®. The Red Hat AMQ streams component, the newest member of the AMQ messaging platform suite, is a massively scalable, distributed, and high-performance data streaming capability based on the Apache Kafka and Strimzi open source projects. The AMQ streams component provides an event-streaming backbone that allows microservices and other application components to reliably exchange data with extremely high throughput. AMQ streams has a particular focus on using Kafka on Red Hat OpenShift, the open source container application platform based on the Kubernetes container orchestrator. -Why Kafka is so frequently used in microservices, Internet of Things (IoT), and event processing. -Why Apache Kafka on Red Hat OpenShift is a great match. -How Red Hat OpenShift delivers clustering, high availability, and observability to Kafka. -How the AMQ streams component serves as an automated Kafka administrator, automating the deployment, management, upgrades, and configuration of a Kafka ecosystem installation. Accelerate your innovation journey using containers. Firms have become more comfortable with containers in the last 3 years and container usage is expected to continue to grow. With growth comes more sophisticated requirements. Containers support configuration management and continuous integration/continuous delivery (CI/CD) processes by offering improved flexibility, performance, and security. Open source software has been key in unlocking container and container platform innovation. Firms have learned to use and contribute to open source to reap the rewards of communities. How container usage has improved in recent years. What the future of containers and container platforms looks like. Navigating the performance and security challenges of containers and container platforms. How containers can improve customer experience and lower costs. How open source can accelerate innovation in your organization. Larry Carvalho, Research Director, PaaS, IDC. Tyler Britten, Technical Marketing Manager, OpenShift, Red Hat. As businesses in all types of industries are being disrupted by startups, organizations are being challenged to digitally transform themselves. Technology is playing a central role in this transformation, and the demand for applications is increasing to meet transformation goals. Application platforms, which are undergoing a transformation of their own, are playing a central role in accelerating application development. -The evolution of application platforms. -How containers are becoming the destination of choice for workloads. -How companies are transforming a broad set of existing and new applications. -Evolving a culture of greater agility. Larry Carvalho is research director of IDC's worldwide Platform-as-a-Service (PaaS) research practice. He focuses on the Cloud Applications Platform (CAP)-as-a-Service aspect of PaaS and directs research into the component competitive markets of PaaS, including business process management (BPM) PaaS, database PaaS, cloud testing, and integration PaaS. Larry has extensive experience in systems integration and the enterprise software business. Tyler Britten is a technical marketing manager for Red Hat® OpenShift® and has spent the last 15 years working with container, cloud, virtualization, and infrastructure technologies. Prior to joining Red Hat, he was a technical advocate for Blue Box, an IBM Company, and principal technical marketing manager and vSpecialist at EMC. Tyler has also been a technical consultant for a small infrastructure reseller, a network engineer for a Fortune 1000 company, and a freelance IT consultant for small businesses. In 2017, the industry standardized on Kubernetes on the defacto container scheduler. So what does Kubernetes deliver, and how much more is needed to operate and maintain a container application platform? Learn from Red Hat’s leadership in the Kubernetes community, and many years of OpenShift customer deployments, how to enable an application platform that is built to optimize developer productivity, security and multi-cloud deployments. As most organizations do not have the luxury of completely rebuilding their technology foundation or immediately adopting new practices and mindsets, they are embracing gradual yet fundamental shifts in culture, processes, and technology to support greater velocity and agility. With software increasingly key to how users engage with businesses and how businesses innovate to stay competitive, the speed of application development and delivery is the new digital business imperative. The cloud-native approach describes a way of modernizing existing applications and building new applications based on cloud principles, using services and adopting processes optimized for the agility and automation of cloud computing. -Evolving a DevOps culture and practices. -Speeding up existing applications using fast monoliths. -Using application services to reduce development times. -Choosing the right tool for the right task. Evolve to a more modular architecture with a cloud-native application strategy that automates your IT and provides continuous delivery and advanced deployment techniques. Cesar Saavedra, Red Hat senior principal technical product marketing manager, focuses on Red Hat® JBoss® Enterprise Application Platform (EAP), Eclipse MicroProfile, OpenJDK, and Jakarta EE. He manages the technical marketing for application development middleware solutions and works closely with engineering and product management on thought leadership. Cesar has authored whitepapers and blog posts and has been a conference and webinar presenter to customers and partners. Before joining Red Hat, he worked at IBM, Oracle, BEA Systems, TIBCO, Lucent Technologies, and AT&T Bell Laboratories. DevOps practices deliver speed and reliability improvements for sustainable competitive advantages. Foundational DevOps practices include the use of agile development, continuous integration/continuous delivery (CI/CD), and cloud platforms that increase the automation and security of software delivery practices to deliver business outcomes. In December 2017, IDC conducted a global study commissioned by Red Hat to assess strategies and spending related to enterprise DevOps, the use of containers and container orchestration products such as Kubernetes, and related topics such as continuous integration and agile software development. -How DevOps practices help improve speed and reliability to deliver sustainable competitive advantages. -Pressures that IT infrastructure and operations teams face to meet the increasing speed of application development and deployment from DevOps teams. -The role DevOps plays in increasing the security of applications. -Frequency of agile development practices used for workloads today. Apache Camel has fundamentally changed the way enterprise Java™ developers think about system-to-system integration by making enterprise integration patterns (EIP) a simple declaration in a lightweight application—wrapped and delivered as a single JAR. - How building and designing cloud-native microservices impacts the way we develop. - How to build distributed and fault-tolerant microservices. - The upcoming Camel 3.0 release, which includes serverless capabilities via Camel K.
Every industry is realizing that the business experience is now software-centric and applications are becoming one of the primary means with which companies engage customers and partners. We now have access to the same technology that the large internet companies pioneered and used to their advantage to dominate their respective markets. What challenges arise when we start building applications to take advantage of this new technology? With all the hype about moving to the cloud, the reality remains that no one-size-fit-all solution exists for running enterprise application workloads due to legacy complexity, data, and security concerns. So how do CIOs navigate the technology options that allow organizations to run any application workload on any cloud? Investment in application programming interface (API) management software increased by an average of 44% from 2012 to 2017, according to IDC.1 This growth reflects the tremendous importance of APIs to today’s businesses. While opening up digital assets promises new opportunities, companies must develop new processes to ensure that APIs are built efficiently and securely. - Use mocking to speed up and break dependencies. - Use a contract-first approach for defining tests that will harden your implementation. - Protect exposed APIs through a management gateway. - Manage deliveries using a continuous integration/continuous delivery (CI/CD) pipeline. Digital transformation projects present many technological and organizational challenges. A key challenge is developing modern, cloud-native applications that connect customers directly using automated business processes and decisions. Creating these applications requires a radical change in how software is built—moving away from traditional, IT-led software development to a process that lets both developers and business experts contribute directly to application logic. Please join us as Prakasha Aradhya, Red Hat Senior Product Manager, will discuss how Red Hat® business rules and process automation solutions help business users and developers collaborate as equal partners to create modern applications. Join this channel to learn best practices and insights on how to: containerize existing apps for increased cost efficiency, deliver new cloud-native and process-driven apps using microservice architectures, take an agile approach to integrate APIs and data, and do it all in a culture of collaboration using DevOps best practices. Presented by: Kevin Phillips, Middleware Solutions Sales Specialist, Red Hat.